Kee Safety’s self-closing safety gates have been designed to be fully adjustable and can accommodate opening up to 1m for the single gate and 2 x 0.9m for the double gate. Full height self closing gates for ladders. Gates are available in galvanised steel finish or yellow powder coated. KEE GATE product range also includes pallet gates which allow safe working for employees on a mezzanine or raised working surface. 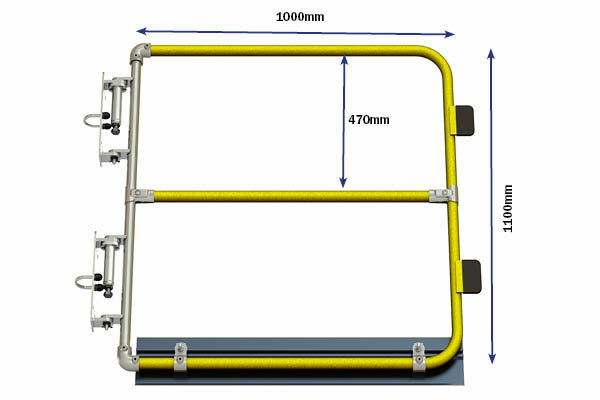 The single self-closing safety gate is supplied 1 metre wide and is fully adjustable; width can be cut to size on-site. 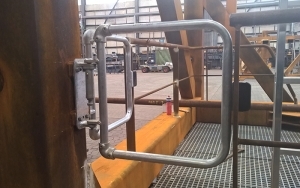 Connecting the gate to the supporting structure is simple - two U-Bolts are used to attach the gate to a variety of uprights or flat surfaces from 33.7 to 48.3mm diameter. The single self closing gate is complaint to OSHA, EN 13374 and EN ISO 14122-3:2016. You can watch the Kee Gate Installation Video and see step by step how to install our self-closing safety gate. Installation instructions are also included in the Kee Gate Single and Double Gates Operation & Maintenance Manual. Double self-closing safety gates are supplied for larger openings greater than 1m wide. The maximum width for double gates is 1.8m. 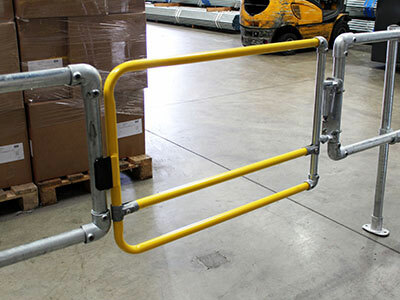 The double gate is compliant to OSHA, EN 13374 and EN 14122 requirements and does not require any locking mechanism to be used by the operator. 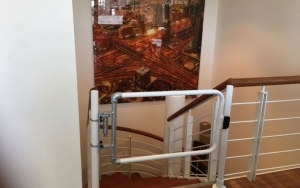 KEE GATE Full Height Self Closing Safety Gate has been designed to comply with BS 4211: Specification for Permanently Fixed Ladders, which requires gates on ladders to offer the same level of protection as EN 14122 compliant guardrail. 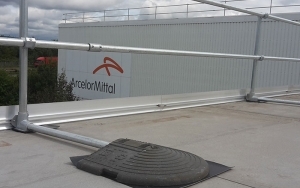 Standing at 1100mm tall and featuring an aluminium toe board, the gate provides additional protection to those working at any level.Full height gate is fully adjustable and can accommodate openings up to 1m. Kee Safety’s self-closing safety gates have been extensively tested by independent bodies, to make sure that our products are reliable and comply with international standards. The safety gates are CE accredited to the requirements of EN 1090 and comply with Work at Height Regulations, European Union Directives, OSHA, EN14122-3:2016 and test requirements of EN13374. KEE GATE self-closing safety gates are ready to install and are stocked locally in our Singapore warehouse, so we are able to deliver them very quickly. Absolutely, all products have been externally verified to the following standards: European: EN14122 Part 3 & Part 4; North American: OSHA, O.B.C. and I.B.C.